The ancient lands of Osirion are blanketed by the sands of time, and eldritch secrets and vast riches lie just beneath the sun-blistered surface. As modern Osirion opens its tombs to outsiders for the first time in centuries, many of these lost treasures and secrets are now emerging - some more malign than others. Can your group of heroes brave terrible guardians, foul cults, and the burning sands of the desert to stop the rebirth of an ancient tyrant? 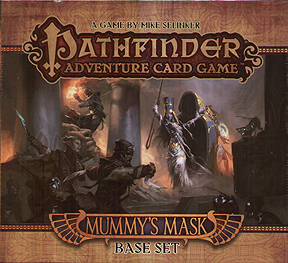 Supplement your Mummy's Mask experience with the Character Add-On Deck, Class Decks, monthly Adventure Decks, and Ultra-PRO accessories (all sold separately).